If hiking satisfies your soul but slogging through snow gives you cold feet, give lowland hiking a try. 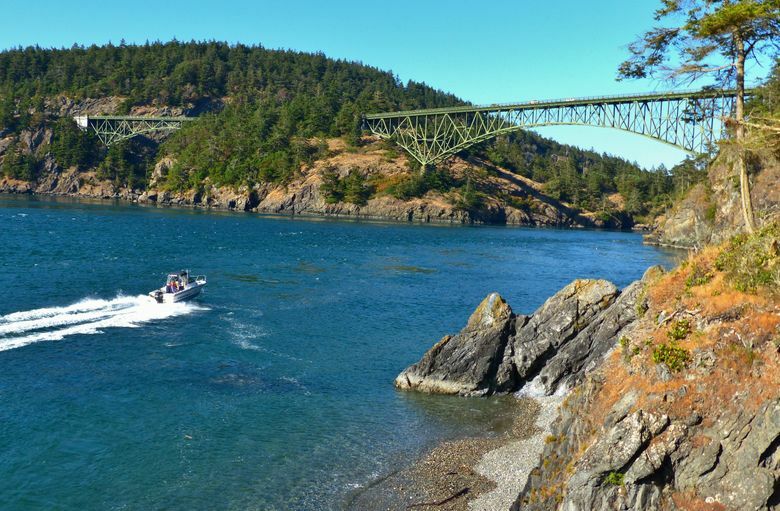 Here are three routes to consider at Deception Pass. 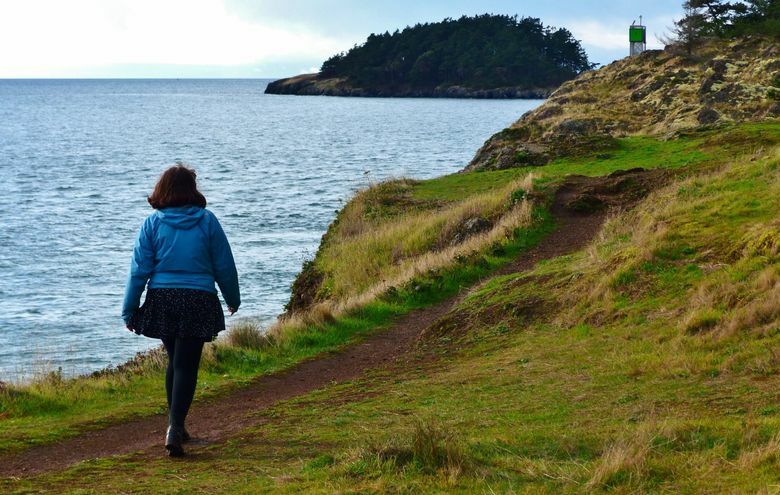 DECEPTION PASS STATE PARK — If hiking satisfies your soul but slogging through snow gives you cold feet, you needn’t abandon your boots for winter. Lowland hikes beckon. Here’s a spot rich with discoveries. Capt. George Vancouver, aboard a ship named Discovery, named Deception Pass in the 18th century when the 450-foot strait between rocky cliffs fooled him into thinking he’d found the mouth of a river rather than a back channel into Puget Sound. Chances are you’ve already done some of your own exploring here — if only to pull off Highway 20 to walk the historical double-span bridge and peer 180 feet down to the spot where tidal changes can spawn kayak-eating whirlpools. 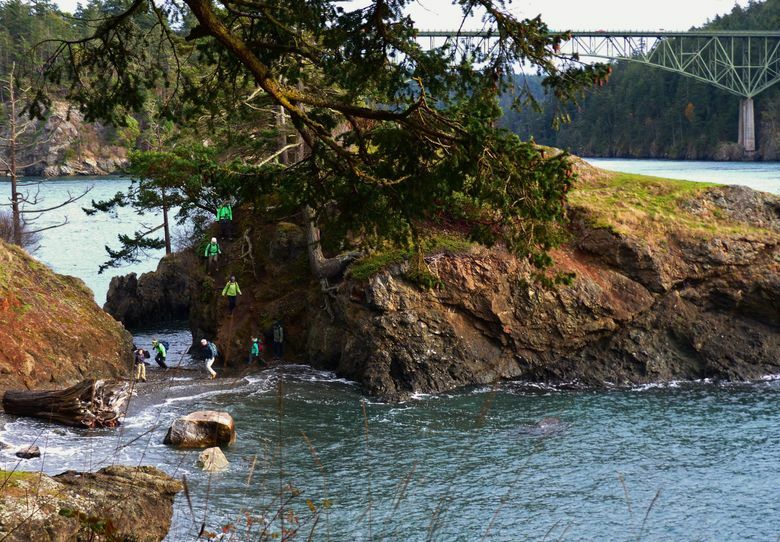 Straddling Whidbey and Fidalgo islands, this is the most-visited of Washington’s state parks. But as with Capt. Vancouver’s discovery, its inner workings may not be immediately obvious. You’ll need multiple visits to do justice to this park’s 77,000 feet of saltwater shoreline, three freshwater lakes and 38 miles of hiking trails traversing, old-growth forest and rocky ramparts. Walk south along this bowl-shaped bay, past a fishing pier, to find the trailhead to Lottie Point and Lighthouse Point. After passing a cattail-festooned marsh, the flat trail lifts its skirts and briefly zigzags up a rocky cliff studded with colorful madronas to offer a wide view of the bay. Descending, ignore the turnoff to Highway 20 and you’ll soon have a choice of continuing straight to Lottie Point or right to Lighthouse Point. From here, the less-traveled 0.8-mile Lottie Point loop edges quiet, shallow Lottie Bay. About halfway along the bay, take an unmarked trail to the left to follow the loop clockwise into salal bushes amid fir and cedar woods. As the trail curves around the point, explore one of several side paths downhill to the hidden payoff: views of the bridge spans from a breathtaking vantage point unseen by most visitors. Photographers make a pilgrimage here where the northern span over narrow, little-seen Canoe Pass fills the viewfinder. Rafts of spaghetti-twined bull kelp crowd the shore. Continue clockwise around the point and you’ll encounter erosion in steep, rocky stretches that might daunt some hikers. Retrace your steps if you’re not up for careful scrambling. You’ll have no problems hiking Lighthouse Point, though it uses false advertising to draw hikers: There is no lighthouse, only a navigational marker with a tiny light. But don’t hold a grudge. It’s a worthwhile 1.5-mile loop, starting with a trek across a sandy isthmus crowded with Nootka rose bushes trimmed merrily with red rose hips in winter. Continue among ancient Douglas firs towering above rocks upholstered in emerald mosses and silvery lichen. As the trail gently ascends the point, you’ll arrive at a view of the bridge’s south arch, seen across teal Lottie Bay. As you approach a burnt, hollowed-out cedar, go left at the fork to the best viewpoints. The trail emerges to grassy hillsides with panoramic views of the bridge, water, passing boats, seabirds and the occasional seal or whale. Continue past delightful little sea stacks and islets, concluding with views across Rosario Strait to Lopez Island. Then tunnel through salal, huckleberry and ocean-spray shrubs as the trail loops back to that burnt-out cedar. North Beach Hike: From the park’s main entrance, proceed to the West Beach lot and at the north end find the trailhead for North Beach, beyond an amphitheater. 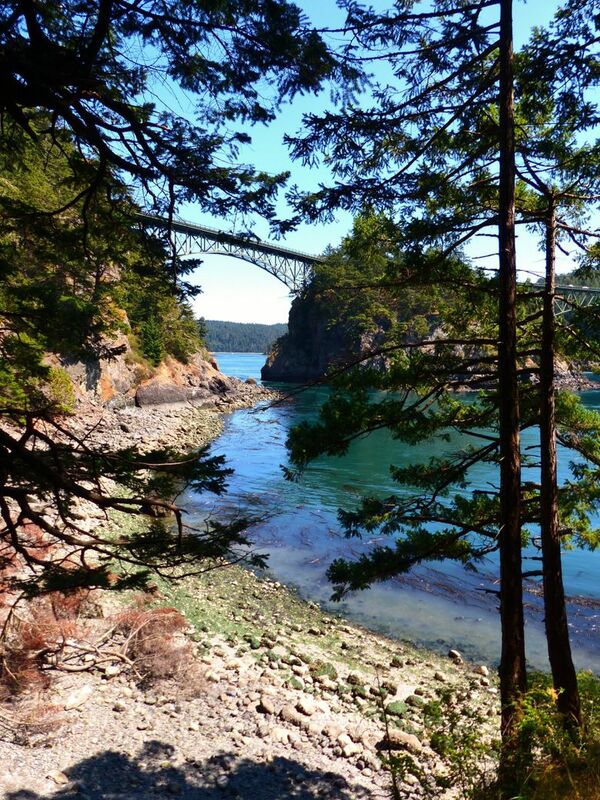 From here it’s 1.1 miles to the bridge on a mostly flat trail through woods with frequent views of Deception Pass waters. Side paths lead to rocky viewpoints or the sand-and-cobbles beach. Hike on the trail or the beach (as tides allow), with the arching bridge growing ever larger in your view. If weather cooperates, you can bundle up and enjoy some of the park’s most scenic picnic sites near the North Beach parking area (the area is closed to cars November through March, but accessible by foot). You’ll get a good look at boats passing under the bridge — a challenge for skippers who don’t wait for slack water between tidal changes. From here, the trail ramps upward. Rustic stone walls are evidence of the park’s Depression-era Civilian Conservation Corps heritage. You’ll soon emerge beneath the bridge’s south end where you can enjoy views of the tremendous steel span. To extend your hike, continue another 0.8 mile to the 484-foot summit of Goose Rock, Whidbey Island’s highest point. 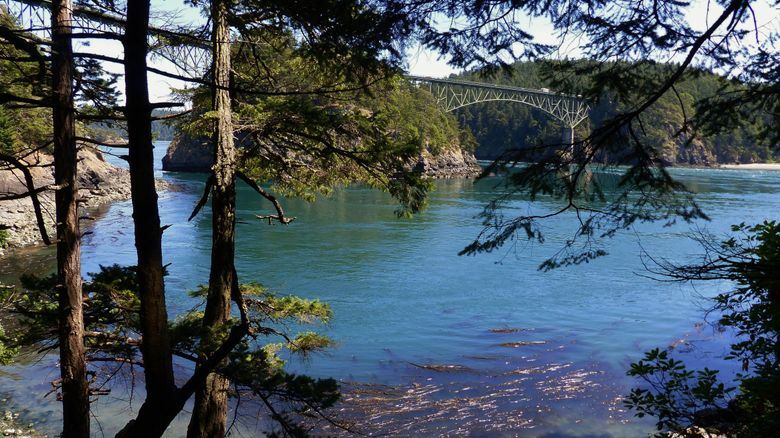 Getting there: Deception Pass State Park (https://parks.state.wa.us/497/Deception-Pass) is about 75 driving miles from Seattle. Take Exit 230 from Interstate 5 in Skagit County and go west on Highway 20 for 11.7 miles. 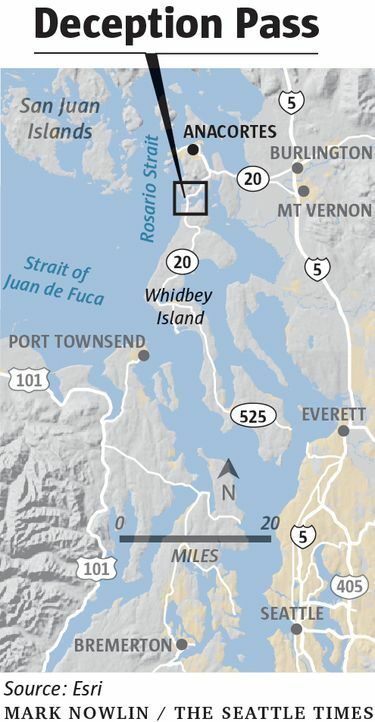 At a roundabout, go south as Highway 20 turns toward Whidbey Island. In 5 miles turn right for Bowman Bay, or continue another 1.9 miles (across the bridge) to the park’s main entrance. Alternate route: Take Washington State Ferries from Mukilteo to Whidbey Island and follow highways 525 and 20 north to the park.